At the end of Marsh Road near Bayfront Park lies a nondescript warehouse space housing a unit that surprisingly defies description. Step inside 3553 Haven Street #6, and it’s simply impossible to process the sensory input: bouncing balls of every size, a ladder for climbing, blocks of wood, a door off its hinges, little floor scooters, hanging pipes, hula hoops, a darkened dome with mirrors and prisms, and every kind of gadget and gizmo, all seemingly begging you to touch and explore. In recent years, Mark had transitioned out of the classroom and into private educational consulting but was jarred to think bigger by the encouragement (and funding) of former students. This past January, he embarked on the all-consuming journey of transforming empty warehouse space in Menlo Park into The Kuriosity Lab. On this particular day, Mark’s nephews, Palo Alto High students Sullivan and Michael Tuttle, have stopped by to check out some of his latest contraptions. “We’re still in Beta testing, so they’re my guinea pigs,” Mark says. After taking a whirl on the math carts and tinkering with lights, mirrors and string in the darkened dome, the boys give their Uncle Mark a thumbs up. “They are usually things you can just find around your house, but then he finds ways to make them really interesting,” says Michael. Although The Kuriosity Lab is still a “work in progress,” Mark says individual students are already welcome for private consultations. Later this fall, the plan is to open up for classroom and group events, curriculum development and teacher training. Mark is also posting free videos on the website to drive even broader reach and engagement. The collective intent is to kick-start as many students as possible. What a wonderful place to connect and learn; Mark has an incredible gift in helping people of all ages reconnect with their enthusiasm, his work is just as important for adults as it is for youngsters and teens. Nowadays when so much is done through the virtual world, it’s really, really helpful to have a hands on program of this high a caliber. Thank you, Mark! Mark did a great deal to inspire me as I moved forward after college. I’m really looking forward to seeing how far this goes. I want to see his lessons on mindfulness, awareness, curiosity, and learning through play resonate with as many young minds as it possibly can. Our nation traditionally understands intellect in only a few limited capacities, and I think Mark is really blowing the gates wide open with Kuriosity Labs. Mark’s techniques are so effective because he mixes understanding of teaching methods and how people learn with understanding of each individual student. Unlike other programs that have a single formula that they apply to all their students regardless of needs, Mark begins by learning the individual learning style of each student, and then adapting his lessons and curriculum to them. 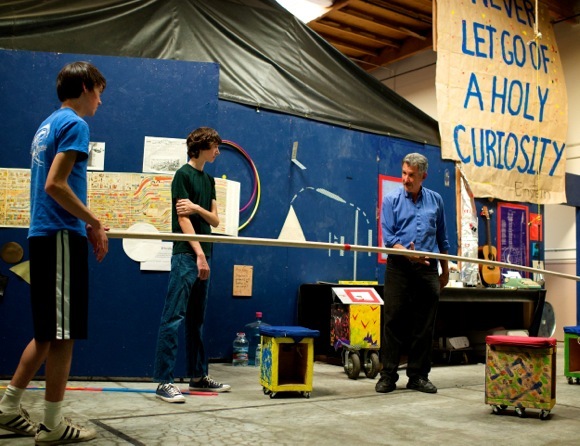 It is this targeted, personal style that makes him different from other learning centers, and also from places like the Exploratorium which target a large, generalized audience. Mark’s lab is so much fun! Even though I’m in my fifties now, I end up playing with the balls, zooming around on the math carts and wondering about the physics of light after watching his amazing light experiments! The Kuriosity Lab is a place to relax, have fun and become curious. I cannot really say I was surprised to find this article. Years before Mark Gordon cooked this concept up, he was my English teacher in Sunnyvale in 8th grade. He left a lasting impact on me and provided a quintessential role model archetype for me. I knew there was something special about him. His methods alarmed some folks and seemed unorthodox yet all these years later as an adult, the lessons stuck with me. I hope more people are able to get a bit out of their comfort zone and can appreciate what this man has to offer. I also remember how masterfully Mr. Gordon was able to get other students that usually did not engage with school materials and subjects to really grab the bull by the horns. Like a boss!